Markings: (Verso) lower right, unknown collection mark. Secondary Inscription: (Recto) inscribed "Guido Cagnasso" in pen and black ink at the lower left and (verso) lower right; (verso) at the upper left "53" in graphite. Domenico Fetti shows the Old Testament hero David, not as an innocent young boy with a slingshot, but as a muscular young shepherd who will soon be king of Israel. With his bulging arm and self-confident gaze, David looks fully aware of the significance of his recent killing. Holding the massive, severed head of Goliath in one hand and an oversized sword in the other, he gazes down at the viewer with a direct and shrewd expression. Fetti used rapid strokes of red chalk with soft parallel lines of hatching to give texture to the soft folds of his shirt and cap and its feathered plumes. Touches of black and white chalk create deeper shadows and rich highlights while animating the image. 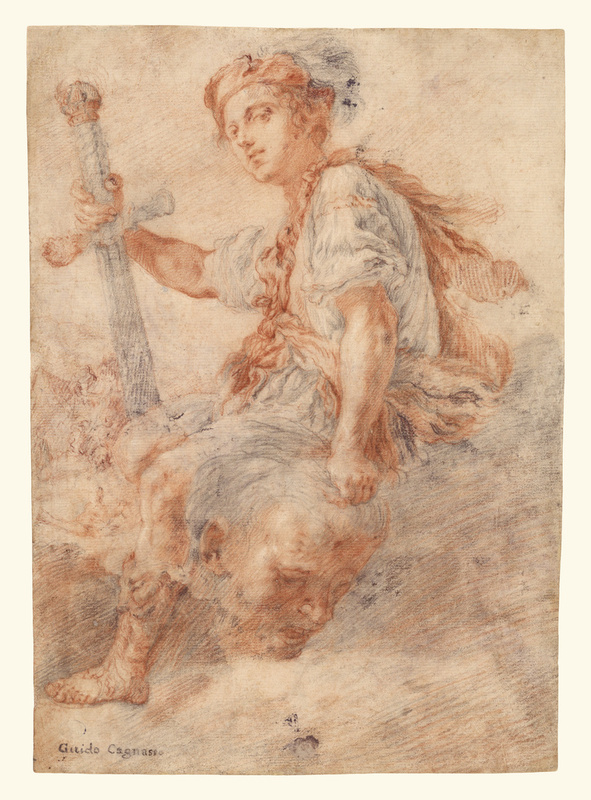 Scholars believe Fetti created this drawing as a preparatory study for his painting of David with Goliath's head.